(1) FAE-5012 - Trauma pad, 5" x 9"
(1) FAE-6019 - Stainless Steel Tweezers, 3"
(1) FAE-5002 - Conforming Gauze Roll, 2"
(1) FAE-5006 - Conforming Gauze Roll, 3"
(1) FAE-6007 - Triangular Sling/Bandage, 40" x 40" x 56"
Most businesses are federally mandated to have first aid solutions that are compliant with OSHA as well as ANSI standards. The SmartCompliance™ Program can guarantee you’re covered. With three integrated components, SmartCompliance is easy to use, saves you money and guarantees your business complies with federal and state OSHA regulations for your industry classification. How it works and how you benefit. Innovative First Aid Cabinet Design. 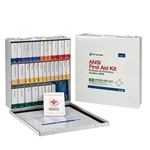 A customizable first aid cabinet that’s easy to use, easy to restock, and eliminates disorganized and missing supplies. SmartTab ezRefill System. A simple, effective system for restocking your first aid cabinet. Guaranteed OSHA Compliance. Simply register your first aid cabinet and use the SmartTab ezRefill System to maintain your guarantee. If OSHA first aid kit regulations change for your industry, First Aid Only will notify you and make the products available to ensure you maintain compliance. Don't waste your companies hard earned money by having a van service refill your first aid kit. Save hundreds (if not thousands) by managing your first aid kit yourself. It's much easier than you think with First Aid Only's easy re-order system. Only order the items that you need and when you need them. Now your business can be First Aid complaint easily and without paying too much. The First Aid Only Smart Compliance stations guarantee compliance with federal standards.